Arthur coloring pages. Cartoon characters coloring pages. 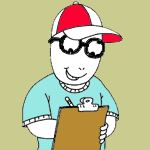 A fun collection of Arthur coloring pages. They are printable Arthur coloring pages for kids. These Arthur color pages provide hours of online and at-home fun for kids. Also look at our large collection of cartoon coloring pages for preschool, kindergarten and grade school children. Click on the free Arthur color page you would like to print, if you print them all you can make your own Arthur coloring book!